These card holders were perfect for my business. I have been ordering from CEP for 3 years now. Thank you. I'm always looking for new concepts in the effort to go green. I like the thought of being able to turn the seed paper into flowers. I had so many options when creating my personalized business card holders. Nice company to work with. Will be recommending Custom Earth Promos to everyone I know. Real friendly and patient customer service team too. These card holders were perfect for my business! Have been ordering from CEP ever since! Thank you! I had so many options when creating my personalized business card holders. Nice company to work with. Will be recommending Custom Earth Promos to everyone. My card holders came out beautiful. Ordered 10,000 of the seed paper gift cards for the ice cream parlor I own. I am excited to see everyone's reaction when the realize that they can be planted. These gift card holders where a huge hit after I explained the basis behind them. My slogan really stands our on gift card holders and I'm thrilled at the exposure I've gained. These gift card holders are great. You can always be remembered through the flowers that grow after you plant the seed paper. I love the makeup of these gift card holders. Just ordered 10k. Great way to add some pizzazz to your gift cards. Received my order of seed paper gift card holders. Color and quality are both top class. very good way to make a lasting impression with customers or potential clients. "Going Green" is a priority for me and these seed paper gift card holders allow me to maintain that theme. 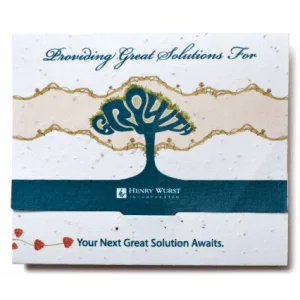 With a creative tri-fold, these Seed Paper Gift Card Holders make the perfect eco-friendly presenter for your gift, discount or business card. Custom Earth Promos' seed paper is the best in the industry, known for its premium quality, texture, and highest yielding germination rates. Make an admirable and lasting impression with gift wrap that keeps on giving! When customers receive their gift or discount card, they'll also be reminded of your eco-responsible intentions, a fundamental consideration for an increasing number of consumers. Affordably priced and highly effective, our seed paper card holders are a great way to invest in your eco-responsible image. Receivers can plant their card holder and hold on to their gift or discount card. In just 1-3 weeks with adequate care, wildflowers will begin to sprout as living reminders of your gift. Each tri-fold holder comes with an envelope. If your brand is launching a "green" initiative, an excellent way to provide eco-friendly fuel to its success is with eco-optimized promoting. You wouldn't want to announce a sustainable initiative with intentions of benefiting the ecosystem with flyers that waste paper or any other physical medium that doesn't mirror your eco-aware intentions. 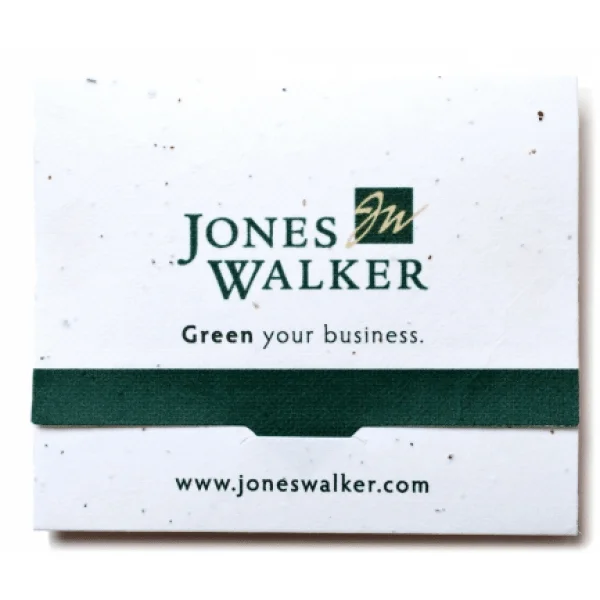 Seed Paper Gift Card Holders from Custom Earth Promos are a great way to inform and promote your audience of the sustainable strategies you've employed. Every time one of these card holders is used to encase a gift, discount or business card given to your customers, you'll be projecting the image of an eco-conscious business with a product you can be proud of. 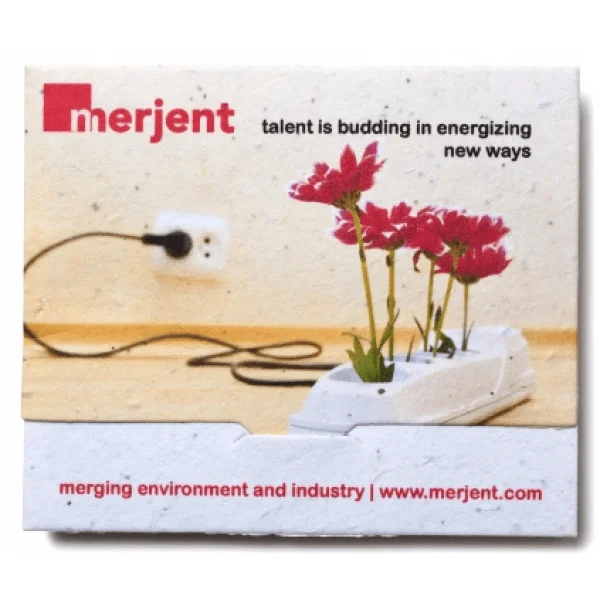 Give your brand image a boost with our custom-designed, eco-responsible seed card holders. 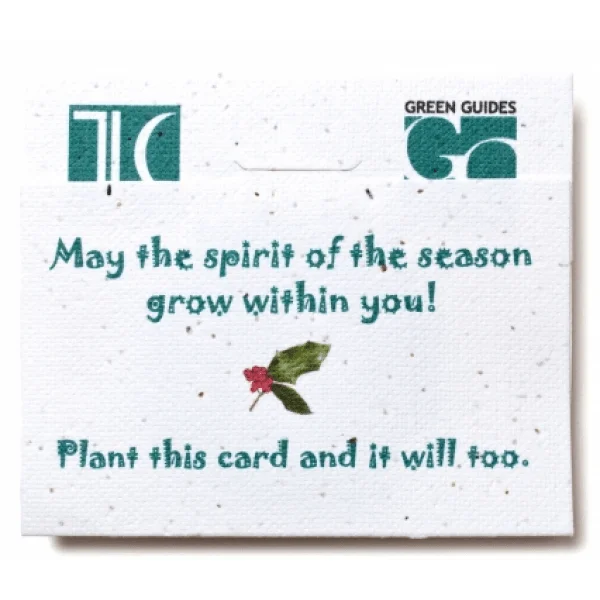 Aside from your basic information, Seed Paper Gift Card Holders can also be imprinted with short messages that you might want to pass on to your customers. You can even customize the imprints with elaborate designs and brand logos, messages or taglines. Leave a lasting impression that will grow into a living reminder of your ethical brand with eco-friendly card holders from Custom Earth Promos. Our products are all stringently tested and California Proposition 65 compliant, guaranteed to be safe from harmful contaminants like lead. Available in 21 all-natural soy-based pigments, Seed Paper Gift Card Holders are the perfect eco-friendly medium to present gift, discount or business cards for your business. We use a varied mix of top quality wildflower seeds with the highest germination rates in the industry. The standard seed mix we use for printable seed papers includes seeds of spurred snapdragon, sweet alyssum, corn poppy and much more. 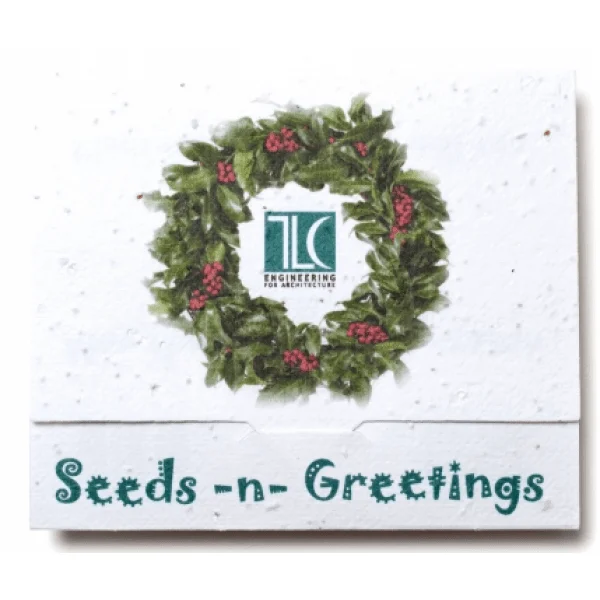 We invite our customers to customize their seed mixes along with the rest of their gift card holder design, with the help of our in-house experts. We utilize a variety of printing techniques to render a bold company logo, meaningful quote or include a short message on your card holder imprint. Take your pick from the available printing methods of inkjet, digital, offset and letterpress. Our skilled experts make sure that your ideal design or message is clearly imprinted down to every last detail. Only all natural, soy-based pigments are used to create the custom graphics of your imprint. We employ a proprietary printing which sprays the seed paper in a non-invasive method that guarantees none of the embedded seeds will be damaged or lose germination. By using all natural ink, we also ensure that there is no potential risk to the soil when the seed paper is planted. The entire card is made with seed paper and can be planted without having to remove the seeds. All our products are California Proposition 65 compliant, which means that they're safe from harmful contaminants like lead, cadmium, and chromium.